haha I was hungry so the SOYJOY bar didn’t last before I took the pic! I was soooo excited to receive my first Vox Box from Influenster! I signed up for this forever ago last year. 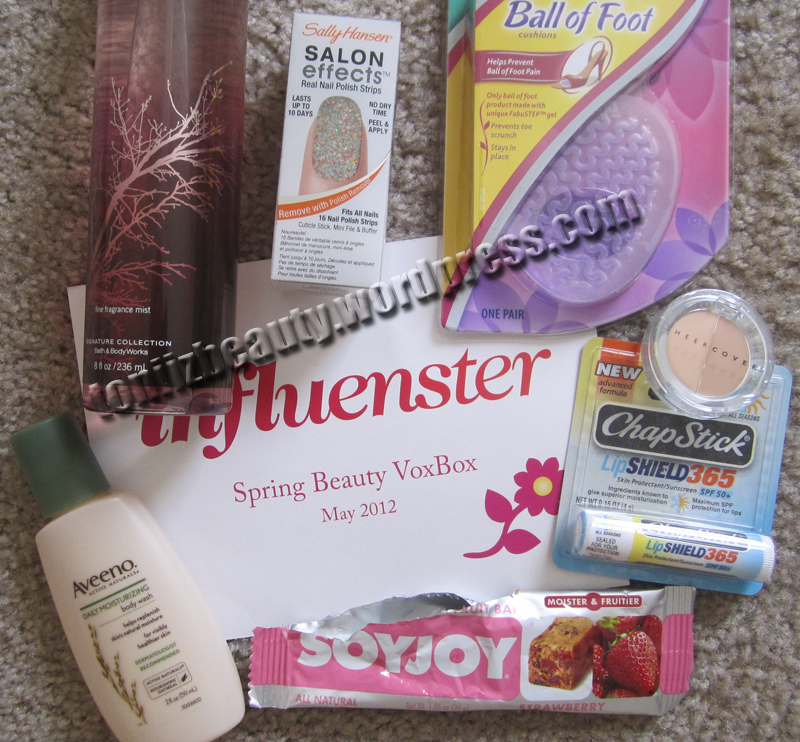 If you are not familiar with influenster its very similar to birchbox, myglam, etc. Except I receive a box of goodies for free instead of paying a monthly fee like the rest. You basically take mini surveys based on your lifestyle and interests and unlock badges. The more badges you unlock the better as they choose random participants to receive a free vox box. In exchange you are just asked to make sure you test and review the products. Sounds like a sweet deal to me! First I just want to say I was impressed at the number of full sized items I received. I mean I didn’t even pay for this and I got several full sized items! This is in contrast to birchbox, and myglam where I am paying a monthly membership to MAYBE get one full sized product. So in my eyes the Vox Box is already a winner! I’ve already tested 3 of them. The Chapstick lip shield is amazing! I thought it was going to be that typical chapstick formula but this one was like a soft butter consistency! Its supposed protect from the sun, wind and cold and not to mention it has SPF50. This is something I would use to moisturize my lips prior to my lipstick application. The SOYJOY bar is an all natural with real fruit and real soy. Umm…not a fan of it. I think it may be an acquired taste. I’m not exactly a health nut so maybe that’s why I wasn’t feeling it. I was really excited about the Bath & Body Works Fine Frgrance Mist because it was a full size (8oz). However, I was not feeling the smell of the one they sent me. The one I received was called “Twlight Woods” and to me had a more mature smell to it. By mature meaning it reminded me of something my grandma would wear. The smell is more on the musk side. Everything else I need to try! I know they threw in Dr Scholls Ball of Foot Cushions as a bonus which I am very happy about since I work in retails and spend hours on my feet. I am also eager to try the Sheer Cover concealer because I see it advertised so much on tv but I don’t personally know of anyone who has tried it. It looks like they even sent me my perfect match! Anyway make sure to keep up with me on twitter, Instagram, and youtube to see any additional info I have to say about these products! If you are interested in getting your own Vox Box sign up here to get started!